Do you believe in the flower power? Do you wish to infuse the fragrance of flowers in your wedding invitations? You can easily make your dreams true with any of our flower themed wedding magnets. Our flower theme wedding magnets will help you to spread the fragrance of your relationship. 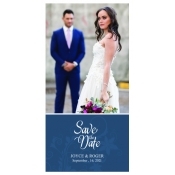 Full color printing combined with lots of freebies make these customized wedding save the date magnets equally admirable for low and high budget couples. All magnets are made in USA. Flowers are indispensible part of wedding, since the days of yore. Be it a church, destination, beach or any other crazy modern wedding, they are incomplete without the backup of flowers. Today, many couples are drawn to the idea of exclusive floral theme weddings. They are largely modeling their wedding day events around their favorite flowers. An idea of the floral theme wedding overlaps with the concept of the seasonal wedding. Do you wish to make the best of both worlds (we mean to say floral theme wedding and seasonal wedding?) Feel free to indulge in flower theme wedding save the date magnets! 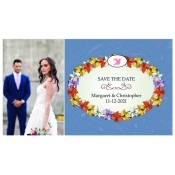 Floral themes are also perfect for any regular traditional and theme weddings which mean you can easily use these save the date magnets for announcing your big day in style. Colorful floral patterns attract with their enviable charm and these wedding magnets will do the same. They are surely going to end up on refrigerator doors or visible surfaces due to their colorful designs. Personalized magnets with astonishing floral themes will inspire recipients and drive them to block their dates for your D-day. This floral wedding magnet will end up as a fragrant souvenir of the event. This current selection is inspired by some popular styles and they are largely crafted over rectangle and square magnets. You can go a step ahead and try it over circle magnets, oval magnets, custom shaped magnets or custom die cut magnets. We will be proud to assist you from conceptualization to shipping with no extra charges. These are perfect for bulk mailing because we offer great wholesale benefits and suitable envelopes at slightly higher costs. 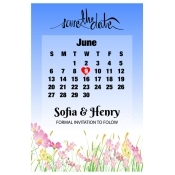 By now, you might have realized that the main purpose of floral theme save the date magnets is to set the mood for the event. You can approach us at 855-762-4638 (Toll Free) or write to us at info@CMagnets.com to know more about your dream designs, discounts, and other details.